Apart from Google Webmaster TOol, Google also offers many other useful tools that can help us better understand our site and enhance our users’ experiences. In this video, we will learn how Google Analytics can provides us comprehensive information on where our visitors come from, how they interact with our site and how often they buy one of our products. In this tutorial, we will covers how sites are displayed in Google search results based upon two core principles: Relevance and importance. In this tutorial, we will learn how Google crawler index our site and how to submit an XML sitemap. Wheather your site is old or new, XML sitemap is highly recommended which can help Google and other search engines to better find and understand the pages on your site. As a webmaster, we probably have a lot to keep in mind. 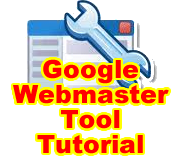 Google Webmaster Central helps us to troubleshoot problems, make our site stronger and provide a platform for us to learn from other webmasters around the world. It’s all FREE. Note: Google Webmaster Tools don’t just show us information but it enables us to take action.